This is a guide to help citizens and visitors alike to explore Portsmouth Driving directions and walking tours will be provided. Sites of interest of all of Portsouth's history are listed. We will post here suggested tours from several hours to all day. 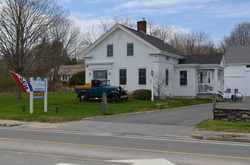 The Portsmouth Historical Society was incorporated in 1938 as part of Portsmouth’s Tri-centennial. It is a non-profit entirely volunteer educational organization devoted to the preservation of Portsmouth's historic buildings, sites, and artifacts. The Portsmouth Historical Society has worked to preserve the Christian Union Church (1865) as its headquarters and museum by using grants from the Champlin Foundations. The outside of the building and the upstairs of the church are completed. Our The Southermost School (1725) was moved to the Portsmouth Historical Society site in 1952. It has been entered on the National Register of Historic Places. The Old Town Hall (circa 1850) was moved to the Portsmouth Historical Society site in 1975. It now houses a large collection of farm equipment and horse-drawn vehicles. Located on the lower level of the main building are a museum, Julia Ward Howe room and small reference library. Showcases display various artifacts from Portsmouth’s early to recent history. Temporary exhibits, focused around a theme, are changed each year utilizing documents and items donated to our collection. The collecting, archiving and cataloging of items is an ongoing process. The Portsmouth Historical Society presents historical programs and speakers, has provided assistance with genealogical searches, property identification and research. It has provided tours of various historical sites and is the host for the Beirut Memorial Ceremony each October 23. Society members participated in the provision and dedication of the memorials to Anne Hutchinson, and Mary Dyer which were placed at Founders' Brook, has hosted meetings of the League of Historical Societies and has a cooperative relationship with the Portsmouth Conservation Commission. Members participated in the survey of Portsmouth's family and historical cemeteries. The Portsmouth Historical Society is open Sundays from 2 to 4, Memorial Day through Columbus Day as well as by appointment and for special events. Membership is $10/year and admission to the museum is free. Many of Portsmouth's private cemeteries have been documented. A listing can be reviewed at the RI Cemeteries Database. A small forest off Carriage Drive has a walking trail through what, reportedly, has one of of the oldest stand of American Beech Trees in the US. The Aquidneck Island Land Trust has developed a walking trail through the forest. There is a small parking area off Carriage Drive. Take East Main Road North and head East on Union Street. Carriage Dr is your first street on the left. The parking area is on the left about 1/4 mile down Carriage Dr.
Circa 1700, now is the Portsmouth Evangelical Friends Church. Providing a crossing to Tiverton back to 1700, the last Stone Bridge was damaged during hurricane Carol in 1954 and was subsequently replaced by the old Sakonnet River Bridge that was replaced in 2012. This is the site of a town common dating back to 1714. Farmers. Ferry service started here in 1640. This 1.5 acre space was originally used by farmers and others to keep their livestock and other goods while waiting for the ferry to Bristol. This became a transportation hub for Portsmouth with steamboats, trolleys, trains and ferries all stopping here. The opening of the Mount Hope Bridge in 1929 ended the ferry service. Elizabeth Anthony Wilkey). The entire rear wall of the studio is a set of drawers which is where Elizabet's grandfather stored his seeds. He was the largest seed man in NE. The house out front is one of the oldest in Portsmouth. The Gallery was an old "yankee" workshop. Preserved and on display are all the old tools and antiques that have always been in the building. The web site is www.dcstoneware.com . Also associated with the Battle of RI, Heritage Park enjoys the highest point on Aquidneck Island. RI-114 North. Take a right at Hedley St and then first left (after the Town Trash center) (Highpoint Ave.). A parking area is on the left. Walk up the hill for the best views on the island. The second highest point on Aquidneck Island is Fort Butts. This was strategic encampment for the Battle of Rhode Island of the revolutionary war. (MORE SOON). A tour of Ft. Butts is scheduled as part of the 375th celebration. Take RI 138 North and left on Sprague St. In about 1/4 mile, take a left onto Butts St and then a left on to Fort Street. Glen Farm is a multi-discipline equestrian facility dedicated to offering top quality care and training of horse and rider. The picturesque farm is located in Portsmouth RI, just minutes from Newport and the beaches. The facilities offer beautiful granite barns built at the turn of the 20th century. Glen Farm has been a dedicated horse farm since 1907 when it was first built by industrialist Moses Taylor. Glen Farm is operated by Ted Torrey life long equine professional. With over 30 years experience training and competing nationally and internationally, Ted has developed the insight and compassion to guide horse and rider to the level they care to achieve. Many of Ted's students have received national recognition for accomplishments in all disciplines. Glen Farm offers training for children and adults in Jumping, Dressage, Equitation, Polo and Cross Country. The Glen Farm also offers monthly horse shows, clinics and arena polo tournaments. about a piece of cultural history. During WWII, the Navy used the South end of Prudence Island as an Ammunition Depot. Artifacts can still be seen from that era. See the Research Reserve Web Page for walking trail information. During WWII, the Melville area was the site of a PT Boat Training facility. President John F. Kennedy trained at Melville. The Quonset Huts from that era have been turned into commercial marine support establishments. The Melville Grille has memorabilia from that era. Click here for an interactive location map. Please return to this site for place information and descriptions.